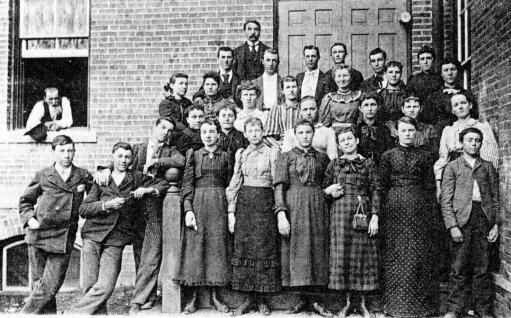 Group of Grade School Pupils of about 1893, the teacher, C. 0. DuBois. From top left to right: Luther Constant, Charles Fait, Jewett Parker,Adrian Lucas, Pierce Correll, Deborah Wright; Eva Kaylor, Pearl Ishmael, Goldie Adams, Katie Roberts, Grace Guyton, Alcey Mussenden, Gertrude Kaylor, Minnie Hurt, Ellen Scully, Henrietta Smith, Eva Warren, Mary Roberts, Elizabeth Johnston; Charles Correll, Elrich Williams, Fred Ishmael, Pearl Correll, Edith Loose, Gertrude Belting, Nellie Ishmael, Hannah Stalling, Simon Williams. In the window "Uncle" Hank Derry, the janitor. 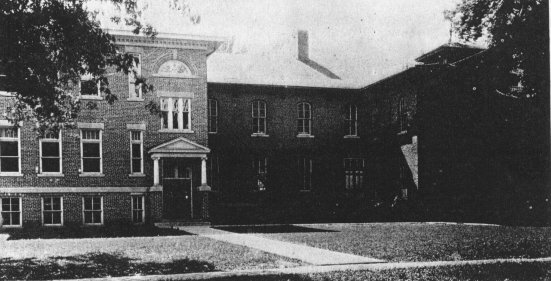 The Grade and High School showing original rooms and additions. 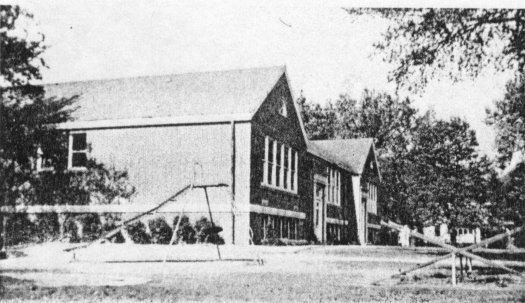 Destroyed by fire in May of 1926.